The Most Fun Best Sandboxes for Kids! 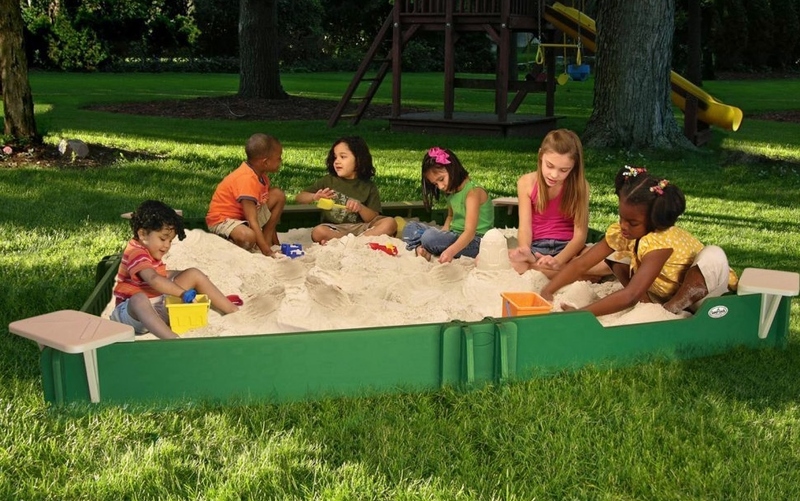 The Most Fun Sandboxes for Kids: Best Outdoor Summer Gift Idea for the Little Ones! 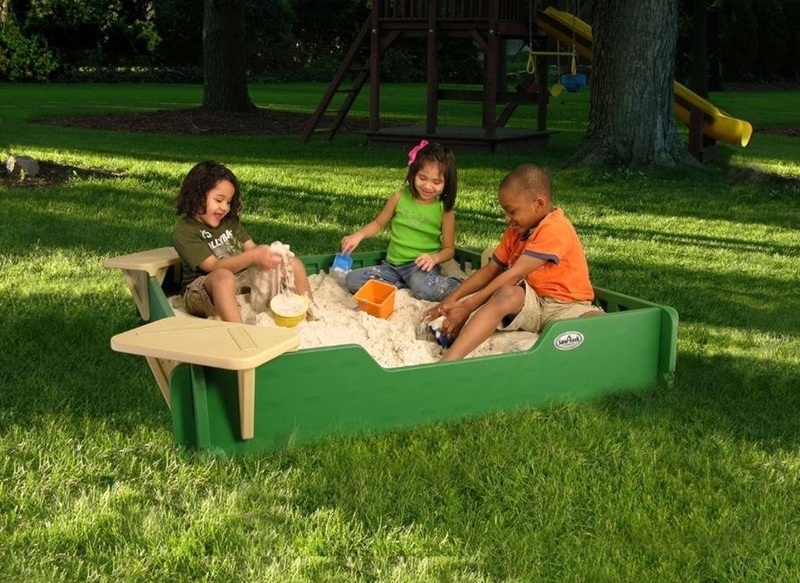 Children’s sandboxes are definitely among the best outdoor gift ideas for summer! The little ones love playing with sand! My favorite ones are the children’s sandboxes with canopy, so they can play and stay protected from the sun at the same time. Nowadays there are so many to choose from though and it can be a little difficult to figure out which sandbox is the best for your child. A few things to keep in mind are: your budget, of course, the size and age of your kids, the outdoor available space that you have in your house, how many kids will usually be playing inside the sandbox and try to choose a sandbox that comes with the cover! After all, you don’t want to end up with a muddy backyard if it rains! Here are my top favorites, high-quality and FUN sandboxes for kids! 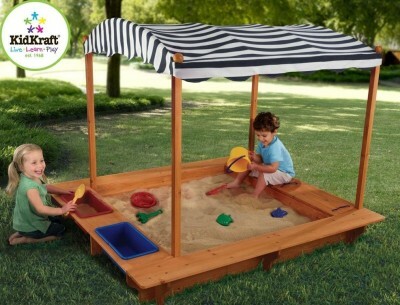 *By the way, how fun is this amazing wooden sandbox with striped canopy for children? 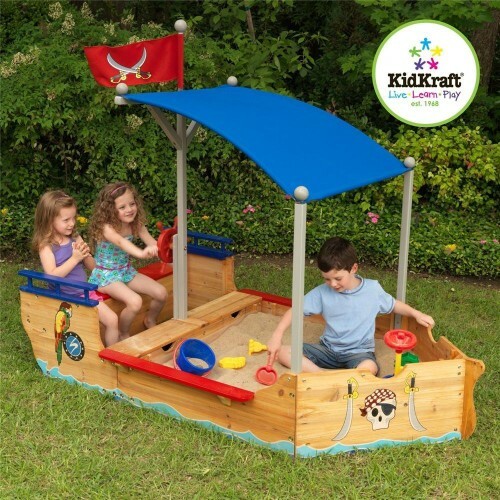 This pirate sandboat shape sandbox for kids is one of the best and most unique fun children’s sandboxes for sale! Kids LOVE everything ‘pirate theme’ and boat shaped! As you can see it’s large enough for at least three kids playing together! It’s also made from wood, so it is pretty strong too! The colorful canopy besides looking very cool, helps keep them in the shade while they play. The price is actually pretty good too! 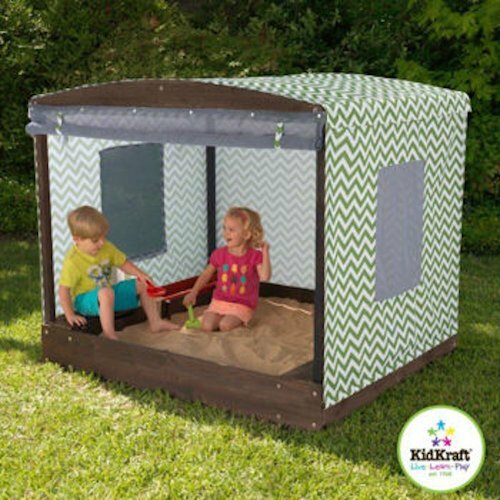 If you are looking for cool and fun outdoor sandboxes for kids with canopy I think you are really going to like this one! Kids play inside and stay protected from the sun! It also comes with three storage bins! What an awesome ‘summer gift idea’ for the little ones this summer! 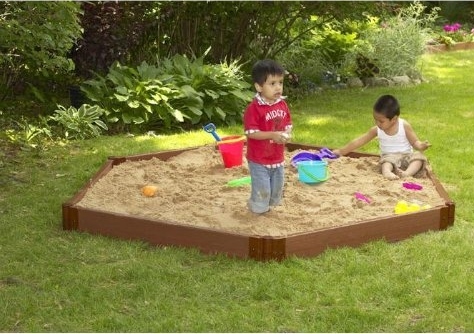 Another cool and pretty large outdoor sandbox for kids with cover! This one is perfect for older kids to play! It’s made from heavy duty solid plastic that attach to each other. It takes about 850 lbs of sand to fill it up! That is a lot of sand! Your kids are gonna love it! If you are looking for a large and affordable outdoor sandbox for sale, then I think you are going to like this very cool hexagon sandbox! It is perfect for the backyard! Super large, at 7 ft. x 8 ft. x 6 in, it fits several children inside! Very easy to set-up and it takes about 500 lbs of sand or more if you really want it completely full. The height is perfect for toddlers and smaller kids. If you are looking for the best sandboxes for toddlers that are also very affordable, then I think this one is for you! It’s the perfect size for a 1 or 2 year old child and very compact! It takes up to 300 lbs of sand and it comes with a nice cover! 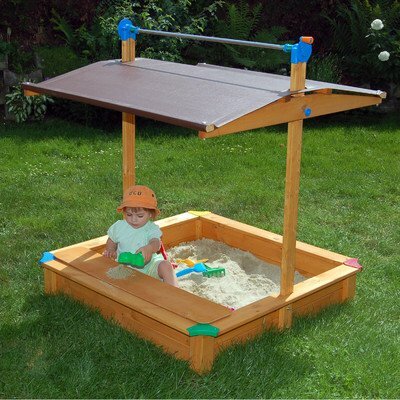 Parents also like to use this sandbox as a toy storage during the winter months! Perfect first sandbox for your toddler! 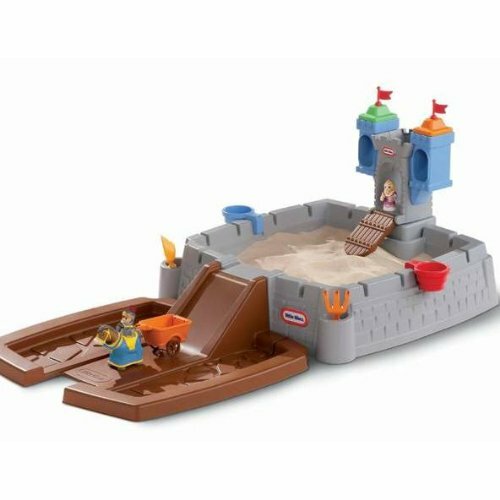 This castle sandbox is one of the cutest and cheapest small plastic sandboxes for toddlers being sold! Kids have a blast playing in their ‘castle’! It is the perfect outdoor gift idea for a 2 year old! If you want to buy the largest outdoor sandbox for kids you can find, I believe this one is for you then! It’s HUGE and it fits up to 4000 lbs of sand and several kids of all ages! It is very sturdy and very easy to put together as well, since it’s made from solid plastic. All you have to do is fit the eight plastic panels together. This is one of the best large sandboxes to have in a day care center or in a large backyard! Perfect to throw a ‘beach birthday party’ for your child! 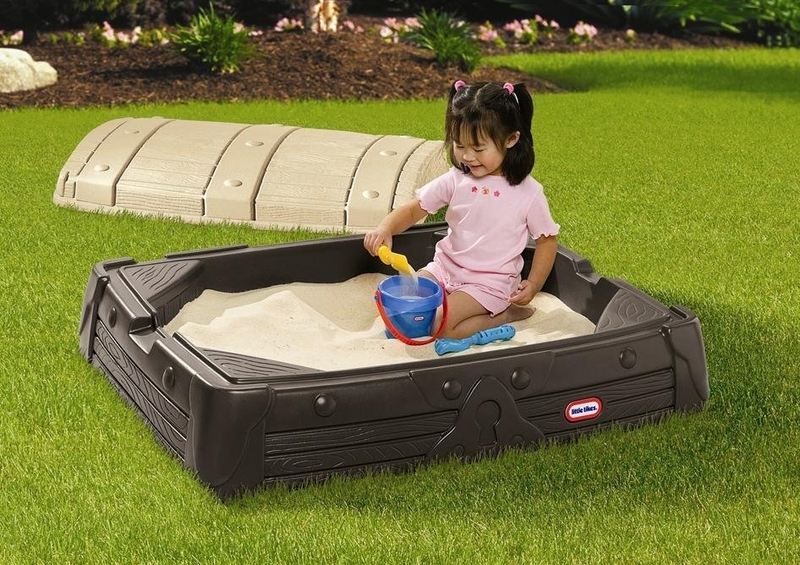 And last, but not least, is this cute rectangular outdoor sandbox with cover that fits two toddlers! Very compact too and perfect for a smaller backyard! I love the cute roof! Looks like a cute house! Awesome Outdoor Wood Cottage Playhouses for Kids!